G.P. Putnam's Sons, 9780425268520, 496pp. When your family’s on the wrong side of the law…what side are you on? The Ludlows are a family of fast-talking Boston lawyers, and patriarch Carl Ludlow treats his offspring like employees—which they are. Black-sheep daughter, Fina, dropped out of law school, but her father keeps her in the fold as the firm’s private investigator, working alongside her brothers. Juggling family, business, cops and crooks is no problem for Fina. But when her sister-in-law disappears, she’s caught up in a case unlike any she’s encountered before. Ingrid Thoft was born in Boston and is a graduate of Wellesley College. Her interest in the PI life and her desire to create a believable PI character led her to the certificate program in private investigation at the University of Washington. She lives in Seattle with her husband. 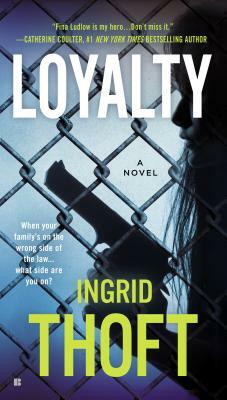 Loyalty is her first novel. "What starts, in Thoft’s dazzling first novel, as a missing-persons case for Boston PI Fina Ludlow—the search for her sister-in-law, Melanie—swells through layers of familial secrets, lies, and betrayals to something approaching Greek tragedy....Readers will be eager to see more of smash-mouth Fina, a hard-boiled throwback equally comfortable shooting from the hip or the lip."